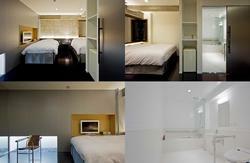 Hotel New Azuma gives the best hotel service at a reasonable price in the heart of Tokyo. Meet people around the world and exchange your travel and adventure experiences. We are located closed to Ueno (the national museums and parks), Asakusa (Sensoji temple), and Akihabara (electric devices), and also easy to access to Tsukiji (Fish market), Ginza, Roppongi and Narita Airport. Convenience stores, a supermarket, and the stations both for JR and metro are all within walking distance. Some sentos (public bath) are also around here, so why not you try them? 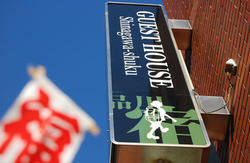 We have Japanese style single rooms. Each room provides air-conditioning facility and own TV set. All the rooms are non-smoking. We also have a kitchenette, a fridge, a microwave, coin-operated laundry, cozy lounge with internet access(10yen/min) and tourist information like flea markets, exhibition, antique market and other hostels. Hot shower available 24hours and Japanese bath is also available on every other day. Tea and luggage storage are available for free for our guests. Check-in time is between 3 and 10pm. The latest check-in is 10pm unless prior arrangement are made. Passport and refundable key deposit (1000yen) may be required on check-in. The curfew is 12am.Payment will be made only by cash. The friendly English speaking staff are happy to make your travel smooth and comfortable. Parcels and your luggage can be sent to your home by EMS (Express Mail Service), SAL and surface from here. We book your bed, bus tours etc ahead by phone if you find it difficult (domestic phone only). We are looking forward to seeing you here in Hotel New Azuma. Keikyu Line Express to Shinagawa Station.